I'm sure I'm not the only perfumista who has noticed how much harder it is to do a quick check for new fragrances at the local mall these days. It is no longer enough to scan the counters at the department stores — just about every boutique in the mall now has its own signature scent or line of scents, and there are more on the way. Coach, the American leather goods line, is the latest to jump on the bandwagon. Their signature perfume for women, Coach The Fragrance, launched earlier this spring. Coach's entry into the fragrance market is designed to "be all things to all people: worn on weekends, but also evenings; bright but romantic; aspirational yet approachable" (via pe.com) In other words, they'd like everybody to buy it. So how'd they do? Well, first off, I'd say they did beautifully on the packaging front (half the battle, no doubt). The Eau de Parfum bottle is classic but fun, the purse spray is cute, and that goes double for the solid perfume in the metal hangtag case (see below). Coach has also introduced a line of accessories in a "fragrance print" design with images of the bottle; there are handbags, scarves, jewelry, and even a "bowtie bikini" and "cellphone lanyard". On the fragrance front, I'd guess they have hit their mark as well. Coach The Fragrance (notes include green mandarin, guava, violet petals, water lily, genet flower, honey, orange flower, mimosa, jasmine, sandalwood, amber wood and vanilla) is eminently wearable. The opening is fruity, and while it is rather sharp for a few minutes, once it settles it is nicely tart, and a nice break from all the fruit candy we've been subjected to over the past few years. The heart is honeyed floral notes given a slightly aquatic bent by the water lily, and the base is a pale, cool woody musk. As advertised, it is more bright than not, and it is very nearly linear once the fruity top notes evaporate, although it does get a little warmer and more vanillic as it dries down. It is sweet but not so sweet as Flowerbomb, and perky but not so perky (or young) as Juicy Couture. It is fresher and cleaner than either, but it isn't a sheer scent by any means. It is a pretty enough fragrance if not particularly interesting (I don't suppose you can be all things to all people and interesting as well) and I'll be very surprised if it doesn't do well. The Coach boutiques, happily, don't seem to cultivate the same air of haughty exclusivity as some of their counterparts in the luxury lifestyle market, so it is easy enough to get samples. Both of the Coach stores I visited were handing them out quite happily on request. Coach The Fragrance for women is an Eau de Parfum, and the lasting power and sillage are both quite good. It is available in 8 ml purse spray ($42), 50 ml Eau de Parfum ($68), or in the solid perfume hangtag ($40). Tried it before it was released (Coach mailed me a sample…cool, huh?) and actually was disappointed. Nice lily/gardenia note, but a little on the 'synthetic' side for me. I agree with your thumbs up on the packaging – very cute and stylish. However I gave my sample away – I guess this says it all, right? Oh, completely agree with “on the synthetic side” — it doesn't smell like natural flowers or natural anything. But that is par for the course with mainstream fragrances these days, isn't it? And this one smells entirely mainstream to me, like they had no interest in going for either niche or luxe consumers. Awesome hangtag! Perfect 10 for packaging and self-advertisement. Unique, stylish, classy, eye-catching, may come in collector colors? With refill? And monogram-able? Could this become a trend? Every leather handbag house will make solid perfume tags to go with the bag? I still have a beef against Coach, though, ever since they canibalized their impecably-made (if a little stodgy) leather goods for the new upholstery-tack-encrusted mishapen vinyl canvas resin junk. They do want to be all things to all people, they maintain a boutique, sell in department store, and they had a line made exclusively for Target, didn't you know! First time I saw Coach bags at Target you could have knocked me over with a feather. I don't know how this could work, as the product is still too expensive for Target shoppers, and the exclusivity of the brand is diminished by outlet dilution. But it does, last business report I read, Coach sales is through the roof. This is why I'll never be CEO of a company. BTW Robin, you've got mail. Just looked, this new fragrance accounted for 3% of all retail sales last reporting quarter. Can you believe! And this thing just lauched. Just a quick clarification: the Coach items that appeared in Target were the result of a bulk purchase from a 3rd party (much like how Coach bags end up in TJMaxx and Marshalls), not a line made exclusively for Target. Coach tried and failed to sue them out of Target stores by claiming they were fakes. I love Coach, I love fragrances, but I wish the Coach bottle was available empty so I could fill it with something I liked a lot better. The packaging on this one is amazing — they get top honors. The fragrance is, well, all things to all people. Your review was spot on. BTW their approach is very friendly, I agree. *slaps forehead* So that's how! My friend and I were so surprised we actually asked a Target manager, and she said Target now carries a Coach line made for Target. I don't know if she didn't know or was embelishing. We could not tell what difference was, there would have been something that said “Made for Target”; they were the same things shown in the boutique. You know, I have no idea if that is good or bad! It actually seemed kind of low to me but as I said, I know nothing. LOL — I'll never be a CEO either, obviously. The hangtag is a great idea, and actually, surprised they aren't doing it in more fashion colors to match the bags. Will have to look for them at Target, I missed that entirely. Agree — love the packaging, the scent is interesting enough to care about it either way. Still, better than much of what came out so far this year! I used to have a stodgy old Coach bag. Can't think of what happened to it — they never wear out, so I must have just gotten tired of it. But do think they'd be out of business now if they'd stuck to that sort of style. I do think the scent is exactly what they set out to do, and hoping for the next one (already due next spring!) they'll set out to do something a bit more adventurous. And hey, don't know where you are but if you're home, welcome back! I found the lauch for this frag oddly fascinating – there's an odd middle ground Coach seems to be trying to tread with their handbags nowadays, between the upper class and upper class aspirations of the middle class, and I did wonder how their first fragrance would reflect that. Sounds like worth trying, if merely to slake curiosity's thirst… Should be double interesting seeing what shakes out from their relationship with Target (on the basis of reading your blog comments) as well. Trying to be everything to everyone usually seems to result in “bland,” but perhaps Coach will trump the odds and land at “pleasant” instead. I'm very curious to try it out! Like you say: trying to be all things to all people. And it is nice, but somehow lacks vision and an independent voice, because of that. Which uniformingly leads to extinction after a couple of years, in most cases. In the long run there has to be something different about a scent to last the test of time. The presentation though is flawless and very becoming. third shift, where did you find the 3% number? which sec filing or news article? I just smelled the Coach fragrance for the first time and I have to say, for someone who doesn’t normally lean toward floral fragrances (I’m a huge fan of fragrances with really prevalent citrus notes – Dolce & Gabbana Light Blue is my favorite), I really appreciate this one. Not only is the packaging beautiful with its silver C monograms (like you all have said), but also the fragrance is just as beautiful – it’s classical, sophisticated, feminine – perfect for all women for all occasions (which is exactly what Coach was setting out for the fragrance to be.) I do not agree that it smells “synthetic” in any way – I think it smells like a beautifully natural white floral fragrance. I particularly enjoy the bright, sparkling and fresh top note – the mandarin and guava really stick out for me. I think the blend of floral notes is just right – it is a beautiful sheer, watery white floral fragrance, with Jasmine and Tuberose (I really like the slight wintergreen effect, which probably comes from this). And I love how the honey (and also the vanilla) aspect really brings warmth to the fragrance. I think it’s deliciously elegant with just the right amount of sweetness, freshness and floralcy! I don't know the perfumer (the nose), but the house is Coach, right? Maybe I don't understand your question? 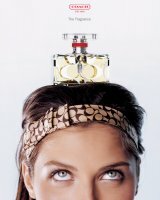 In searching for the perfumer of Coach Fragrance, I found a business article that said Coach had Estee Lauder develop it. That's all I was able to find. Yes, Estee Lauder's Beautybank division developed it, but that doesn't tell you anything about who the perfumer is. I’m curious about these fragrances because they now arrived in Brazil in March 2013 through Sephora …. but from what I read, the brand still has to mature their productions.